Learn the truth about language learning forums in episode 1 of the Power Learning Podcast! Episode 1 introduces our new English language learning podcast series and discusses one of the biggest problems with learning English – how to meet native English speakers in the real world to practice with when it’s comfortable and easy to look for speaking practice partners in language learning forums. Many online courses offer language learning forums or communities for English learners because that’s what students often request. We don’t offer forums because we want our students to get out in the real work to become fluent faster with Master English Conversation, our total English fluency and speaking confidence program. Well, hello, and welcome to the very first englishanyone.com podcast. I have a brand new microphone, and I recommend you use headphones in order to listen to this, so you can get the full benefit of these great, uh, microphones that I have here. These are 3D stereo high quality microphones I’m using, and if you have headphones on right now you’ll be able to listen. You can check this out, it’s very cool. So now, I’m talking to you over here, and I’m moving around, and I’m talking to you over here now. But I got these special microphones for Christmas, and I’m really excited to start using them now on this podcast. Just a little bit about myself, if you don’t already know who I am, I’m Drew Badger, the Co-Founder of englishanyone.com. 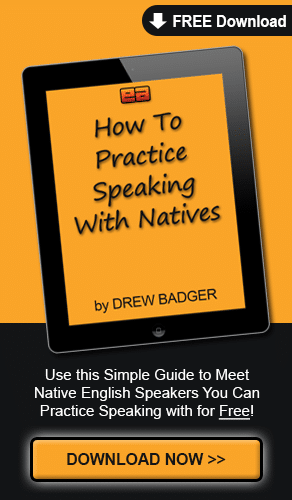 I’m an author, and a English speaking confidence expert, and I love to help students get out and achieve their dreams by being able to speak English fluently and confidently. In these podcasts, this will be sort of a stream of consciousness. A stream of consciousness is not having something written down, you just speak about things as they come to you. So this is a stream of consciousness. I will have these on iTunes as usual, just like a regular podcast. Um, you can also find the transcript, as soon as I finish the transcript for this and the other episodes of the podcast that I’ll be releasing. You can find those on englishanyone.com, and I’ll also put these on YouTube. You can notice today I have maybe a little bit of a cold. It’s winter here. Uh, today is, I think it’s a Tuesday or a Wednesday, I don’t remember. Maybe it’s, uh, I think it’s Wednesday, January 9th, and it’s the first day, uh, for releasing a brand new podcast, and I’m really excited to start talking today. Usually, when I go to sleep at night, I’ll listen to something, and there are a lot of, uh, it could be news, or maybe a movie, or something like that, but there are certain voices that I really like listening to when I go to sleep. So even if I’m not necessarily learning for the, um, just for the information, I like listening to the sound of people’s voices. It’s very interesting to me, and it’s very soothing to me, very calming. Uh, I get lots of mails from people that like the sound of my voice, so even though I think my voice sounds a little bit weird, uh, I figured a podcast would be an excellent way for other people to listen to my voice. Maybe you can listen before you go to sleep, or as you’re falling asleep, or in the car, or at work, or wherever you are. And you can mimic my pronunciation, so try to make the same sounds I do, and really begin improving your English and just listen to more kind of native English from me, and even learn a few things about how to study as well. So this podcast, each episode will have a particular topic, but, as I said before, it will be a stream of consciousness where I’m just kind of talking about an idea, I don’t have anything written down, and you’ll hear me say um and uh and thinking about things. And I’m doing that because I want you to hear how it sounds as a person that’s actually talking. So my English will not always be grammatically correct, I’ll be making pauses, and thinking, and my sentences will not always be perfect, and I want you to do the same thing when you speak. Think about expressing yourself, and not so much about trying to be perfect or correct all the time. The point is really to communicate with other people and express how you feel, and the meaning of your sentences and your ideas, but they don’t have to be correct in order to do that. In today’s podcast, what I want to talk about is something that’s really near and dear to my heart. And to be near and dear to your heart means it’s something that’s very important to you. And this is the idea of when you lead people, just like we do at englishanyone.com, we are kind of teaching people how to speak and we become leaders in that way. And when we lead, it’s difficult, especially when you have a business. You have to kind of make a choice between doing what you think is right, and also doing what other people think you should be doing. Now, this is a little bit tricky, so I’ll go a little bit deeper into it. One of the things that happens in business, uh, especially if you have a big company, is that you will ask people what they want. And oftentimes it’s a great idea to ask people what they want, but a lot of people, either they don’t know what they want, or because they’re not, uh, they’re not experts in what they’re learning about or what they’re talking about, they can’t really answer that question. In the case of learning English, the typical thing that a lot of people do if they’re selling online courses is they will offer a forum where the learners can come and you can all kind of come together. And this is something that a lot of people ask for, and they expect, when they have a course or something like that, that they will be in a community of other people that are also learning the language. And this is interesting to me, because I think it’s not the best way for people to learn. And this is a reason why we don’t actually offer any kind of community like that. Now, that may not be the ideal situation for everyone, but certainly for myself, when I was learning Japanese, I was basically just talking with Japanese speakers. And I didn’t spend any time in a classroom at all. I basically taught myself Japanese, I would learn a few things watching a movie, or reading a few books, or something like that, uh, but I would spend most of my time talking to people. And this gets back to whether or not you should be comfortable when you learn or whether you should be challenging yourself. And it’s very important for you, when you become a learner of English, or if you want to become great at anything else, that you challenge yourself. And as a business, other people, like other students and other teachers, and even other businesspeople, might encourage us to have a forum, or some kind of community, or something like that, where people can come and students can talk to each other about learning. And they would recommend we do this because that’s what people are asking for. And this is what pretty much every English course you find online has, and whatever the English program is, usually there’s some kind of forum. But we are probably maybe the only course that does not have a forum, um, because it’s not the best way to learn. And smart students know that if you really want to get fluent in language, or you want to get good at something, you have to spend your time doing that thing. When students ask me why we don’t have a forum, or I talk with other people about why we don’t have a forum, basically what I explain is that, let’s say you want to get really good at tennis, or some other sport. You can either try to play against people that are at the same level as you, or you can start playing with people that are much better than you. And playing with people that are at the same level that you are is comfortable, and it’s easy to do, but it doesn’t really help you improve. The only way to get better at something is to compete, or to practice, or to train with other people that are better than you at whatever that thing is. So, when I want to learn something, I don’t really spend a lot of time talking to other people that are at the same level as me. I always want to find other people that are at a higher level than me for what it is I want to learn. In the case of learning English, what we always recommend to students is that you don’t focus on studying the language, and that you do not spend very much time at all in English learning forums. So we don’t create a forum, because there’s already tons of them. There are lots of places to practice learning online, but the problem is that most people, they want to do what’s comfortable. They want to get fluent, but they also want to do what’s comfortable. Our subscribers to Master English Conversation and the other programs that we have at englishanyone.com, these really are special learners, and we always encourage these students to go out and try new things, and to not do what’s safe. To not do what’s comfortable. And when they do that, they really find that they start getting success much faster. And that’s why, in Master English Conversation, we teach students how to go out and meet people and to get away from the forums. So when you’re looking for a program, if you are looking for something that has a forum, or a community, and you think that’s important to you, really think about what would be best for you, even though it’s not comfortable, uh, to get fluent in the language faster. 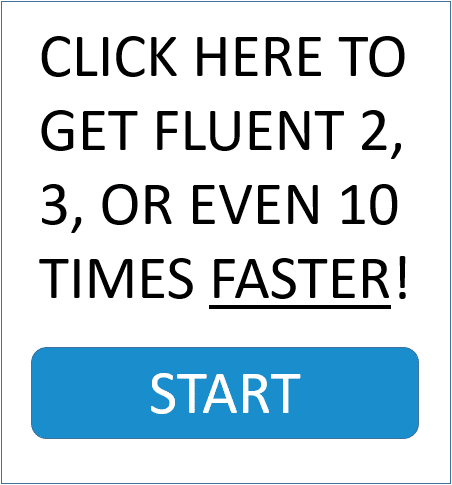 For englishanyone.com we only want students that are really excited about getting fluent, and they want to work hard. We want to sell lessons to students, but only to students that are going to use the lessons and actually get fluent faster by following the advice that we give. If you are the kind of student that wants to be comfortable, it’s okay. There’s not, there’s not a problem with that. But, it’s going to slow your progress to becoming a great speaker of English. I had a nice, a really great student from Vietnam I was having, uh, private lessons with a few months ago. And he worked, actually, uh, in America, and he’s a really great guy, and I really loved talking with him. And it was interesting that he was living in America, or he still is living in America, and he works at a factory, and he loves, uh, kind of mechanical things like working on cars. And I was talking with him more about that, and I asked him why he wasn’t doing more of that in English. And he didn’t really think so much about it, but he was thinking, well, it’s kind of hard to meet other people, and, you know, to start speaking, because he wasn’t so confident about his English. And I explained that if you try to focus on the English, uh, of course it’s going to be a very difficult thing, uh, for you to kind of learn and then want to practice with other people, because it can be embarrassing if you don’t speak well and you make lots of mistakes. But, instead of focusing on the English, if you focus, in his case, on the cars, then if you find other people that are also interested in cars, and you already know things from your own country, or your own language about that, then that’s how you really get into the language, and how you really start making lots of friends that are interested in the same things you are. But it really has nothing to do with the English language. I hear a lot from students about how they want to go out and practice their English, but what they should really be doing is practicing whatever their interest is in English. This is a very subtle, or a very slight, a very small difference in the way you think, but when you change that way of thinking it becomes very powerful. So, again, when you’re going out and thinking about practicing, think about challenging yourself in order to get fluent faster. You really want to get out and think about how you can improve by pushing yourself. You want to challenge yourself and not do what’s easy. There are so many people learning English all over the world, but very few can actually speak. And the reason is, just like being able to succeed at anything else in life, there are those people that actually work hard and push themselves, and there are pretty much everybody else that doesn’t really bother doing that. They have kind of hopes or dreams about being able to speak, or achieve whatever else they want to, but they never really push themselves in order to achieve. So, I want everybody listening to this, even if you never become a subscriber to Master English Conversation, uh, or any other program for helping you learn English, that you really think about pushing yourself to take every opportunity you can, and to not make excuses about, well, I can’t speak because, uh, I have this problem, or I’m in this country, or something like that. Because no matter where you live in the world, I guarantee you there’s somebody else that also lives in that same country that can speak English fluently. And the reason is only because they change the way they think. The way you think is very, very powerful for how you can learn English, or how to achieve at any other sport or thing, like business, in life. And if you can really think about how to push yourself in situations, that’s where you’re really going to see lots of improvement. So going back to what I was talking about earlier about the forum, when you think about spending time in English forums, it’s great to meet other people that are also learning English. But you have to balance your time between the time that you spend in a forum and the time you spend actually with native speakers using your English. It can be a trap. A trap is, um, kind of like a dangerous situation, or something that you don’t want to get into, because it will stop you from making progress. So be careful, and really think about balancing your time between speaking with other people in forums, and actually asking questions about the English language, versus getting out and using the English language by studying or doing things that you’re already interested in, in your own language. So, again, just to wrap up this section of, uh, this part of the podcast, uh, when you think about wanting to join a forum, if, uh, especially if you’re thinking about joining our program, Master English Conversation, in order to actually become a great English speaker and get out and really speak, then think about whether or not you’re actually ready to challenge yourself. Because we don’t want anyone on our program that’s not ready to do that. It just won’t be very much fun. You’ll learn a lot, but if you’re not ready to do that, then, uh, it’s better to find a program that you’re more comfortable with. But, if you are the kind of student that is really excited about getting out and practicing your English, and you’re really ready to find how you can actually become a great speaker, then I recommend you try the program. Because we’ll teach you how to get out and explore the real forum, which is the actual real world. And this is where you should be studying. Well, I hope you’ve enjoyed this very brief introduction to this podcast. Uh, I will have some of them, again, they will be longer than others, or shorter than others, and it really just depends on what I feel like talking about, or any questions, or anything else that I get from students. But I know, when I’m listening to something, I actually like listening to long things because I can put it on, and listen, and I can do something else and think about that while I’m listening as well. So if you have any questions, I really want this to be a, a dialogue, so you can comment below this on YouTube, or on englishanyone.com, and when we put this up on iTunes and set up our podcast account over there, then you’ll also be able to download these and listen to them wherever you like. So for this first podcast, I really want to know what you think about that. What do you think about forums? I actually asked one of our students who is in Master English Conversation about that. Uh, she’s a great student from Germany, and she actually agreed with me. Uh, and it’s a difficult thing to do, because it’s comfortable to say, well, you should have a forum, uh, because people do ask us why they do that. And maybe for, uh, selling more lessons it’s a good idea if we have a forum, but for really helping students get fluent, I honestly think it’s a better idea if we don’t have one. If you’re ready to start speaking real English, then I highly recommend you try a free set of Master English Conversation lessons with, uh, our Power Learning English Newsletter at englishanyone.com. So feel free to comment down below this video if it’s on YouTube or on englishanyone.com, and let us know what you think about that. Do you agree? Do you think we’re wrong for not having a forum? Do you think it’s better to have one? I’d love to know what you think. Also, if you think there’s any music we should have at the beginning of the podcast, usually a podcast will have some kind of little cool music at the beginning, I don’t really care about having that or not, but I’d like to feature some of your music if you have some. So anything short, if you want to send it to me, I will feature your name and your music at the beginning of our podcast, so we can get your voice and your music out there as well. So have a great day, send us any questions if you want to know more things, and we can put them into these podcasts as well, and then we can get a lot more deep into a lot of issues about learning English and, and how to actually use English in the real world. Have an excellent day, and I’ll see you at englishanyone.com. Bye bye.